When I was in middle school, I had a class project which for some reason involved making Greek foods for an all-Greek potluck. My project partner and I made a white bean soup and baklava. I had never made baklava before but I found a recipe on the magical interwebs and we gave it a try. It. was. awesome. It was so awesome that I ended up making baklava on a fairly frequent basis all through high school for various school and family functions. Then I went away to college and after that, I started working full time and the baklava days became few and far between. Then over the Thanksgiving holiday, Boy’s dad sent us home with 3 pounds of frozen chicken. That meant we had to reorganize the freezer to make room. And yes. You got it. We remembered we had the phyllo. 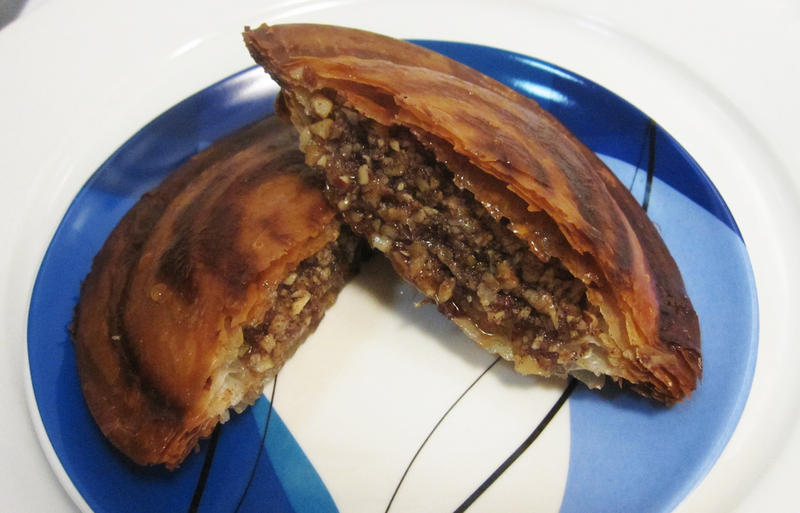 So today was a glorious Baklava Toas-Tite day. We based our baklava on a recipe from Epicurious, which has a relatively short but delicious ingredients list. 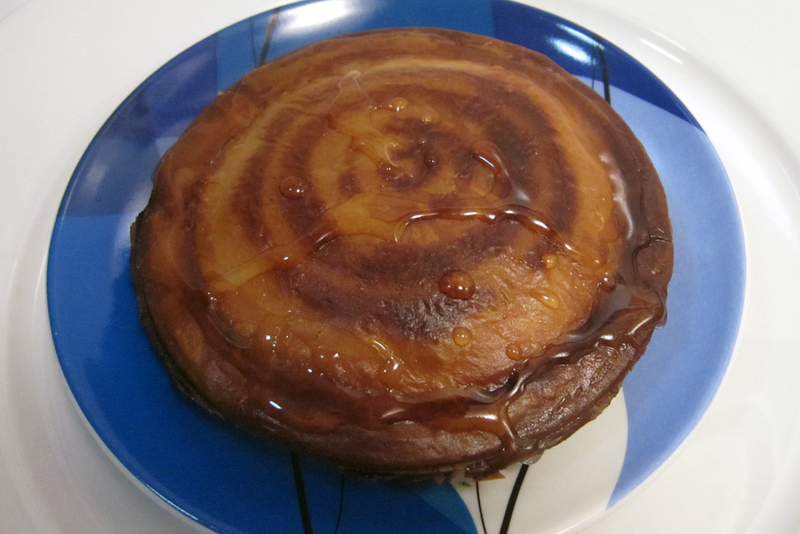 To make the syrup, place the sugar, water, lemon juice, cinnamon sticks, and cloves in a small sauce pan. Over low heat, stir the mixture until the sugar dissolves (about 5 minutes). Stop stirring, increase the heat to medium and cook until the mixture is slightly syrupy (another 5 minutes or so). At this point, remove the syrup from the heat and let it cool. You should have about 10 ounces or so (1-1/4 cup) of syrup. Now let’s pause here. You can make the syrup right before you make the baklava or you can make it up to a week before. If you pre-make the syrup, throw it in a jar or other air tight container and keep it in the fridge. Epicurious says to discard the cloves and the cinnamon stick but I just leave it in there for extra spice. 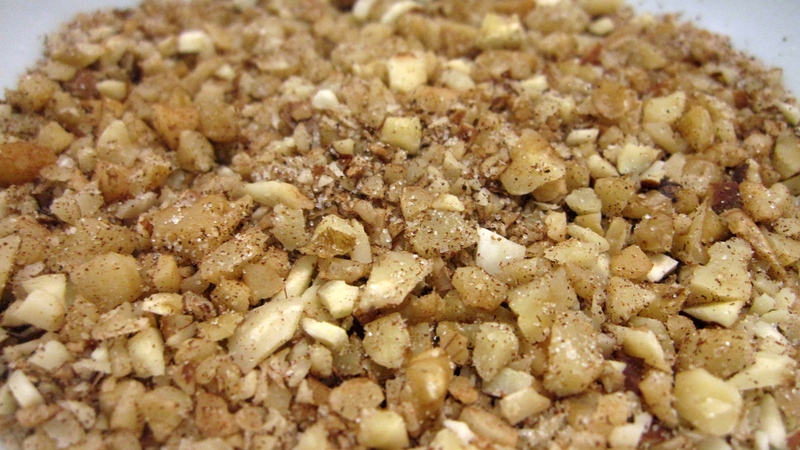 Finely chop the walnuts and almonds (or toss them in a food processor to make them coarsely ground). 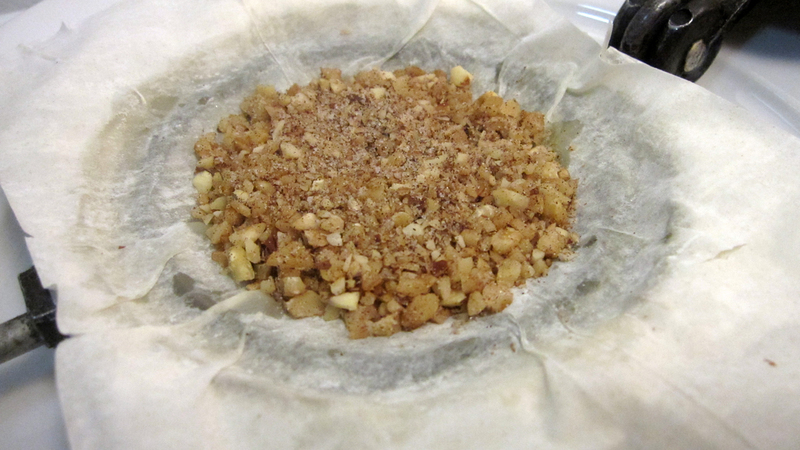 Mix the nuts with the sugar, cinnamon, and cloves in a small bowl and set aside. If you find your phyllo is getting a little dry as it sits out, you can place a damp towel covered by a sheet of plastic warp below the phyllo and fold the whole thing in half so that the phyllo is in the middle of a plastic wrap / damp tea towel sandwich. Using a pastry brush, brush melted butter onto one side of your pie iron. Place one square of phyllo onto the buttered grill. Brush a light coat of melted butter on top of the phyllo, making sure to coat the edges where the sandwich will seal. Then place another square of phyllo on top of that. Repeat the butter / phyllo process until you have 4 sheets of phyllo layered (ending on phyllo, not butter). 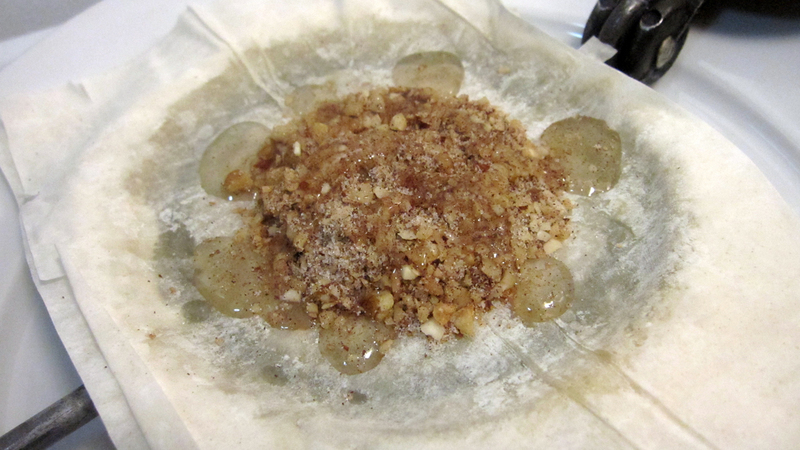 Now sprinkle half of your nut / spice / sugar mixture on top of the phyllo. Brush butter around the edge of the exposed phyllo on the bottom and add a layer of phyllo on top. Brush that layer with butter to cover it entirely. Add another sheet of phyllo and butter and repeat until this bit has 3 or 4 layers of phyllo, ending on phyllo (not butter). Sprinkle the second half of your nut mixture on top of that. If you’d like, spoon a teaspoon of syrup (which should be slightly thickened now that it’s cool) onto the nuts. Brush butter around the edge of the exposed phyllo on the bottom and get ready for your last phyllo layer. Add a layer of phyllo on top. Brush that layer with butter to cover it entirely. Add another sheet of phyllo and butter and repeat until the final portion has 4 layers of phyllo, this time ending with a last coat of butter to ensure the crust doesn’t stick to the grill. 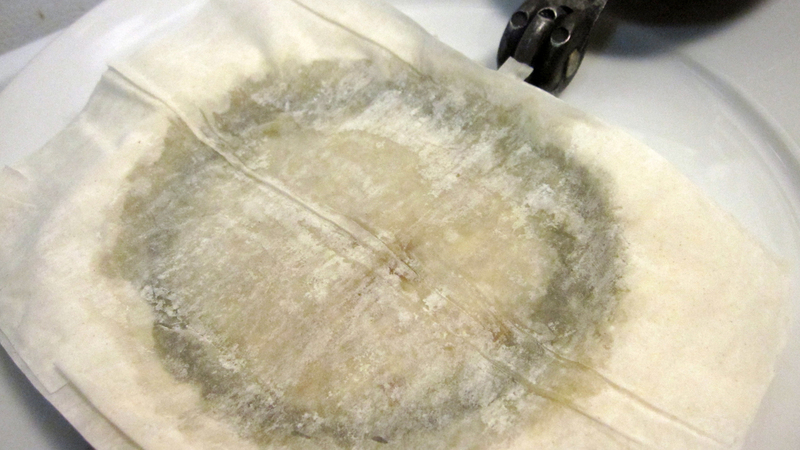 Close your pie iron and trim the excess phyllo. Toast over medium heat for 4 minutes on each side (or until the phyllo is a golden brown), flipping the pie iron every 2 minutes. 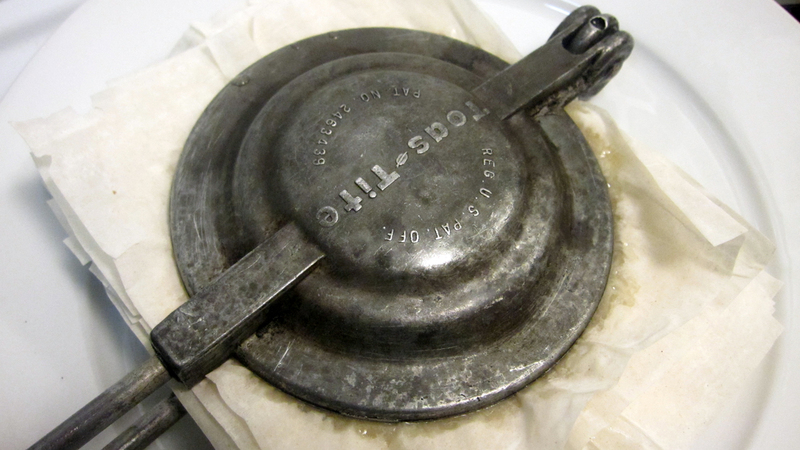 Remove the baklava from the pie iron. Spoon 1/2 to 1 teaspoon of syrup on top. When the baklava has cooled just enough for you to handle (but is still warm), cut the baklava down the middle. Because the non-pudgy-pie version (i.e. the “traditional” version) of baklava requires that you slice your baklava while hot and then pour the syrup over it so it absorbs, slicing this one is important. Drizzle half a teaspoon of syrup into each half on top of the nuts and spices. Let the syrup absorb a bit and then any time you’re ready, eat it up (and then wish you had another). 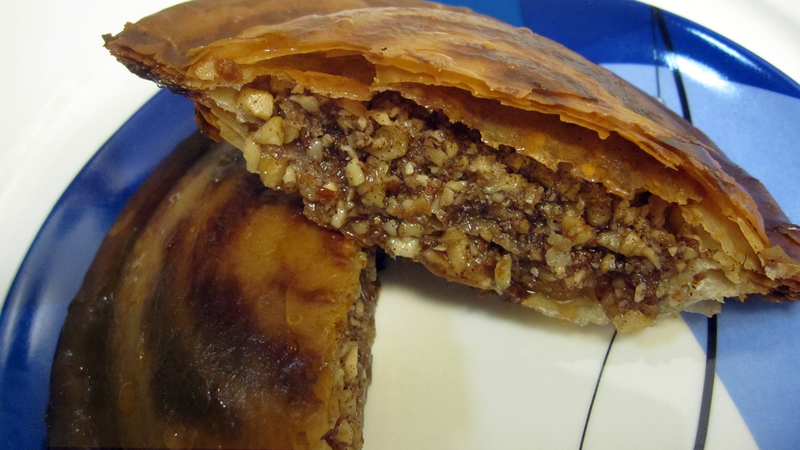 Compared to traditional baklava, you get less of a layered affect with you use a pie iron. since the middle layers don’t get as much of the baking action. 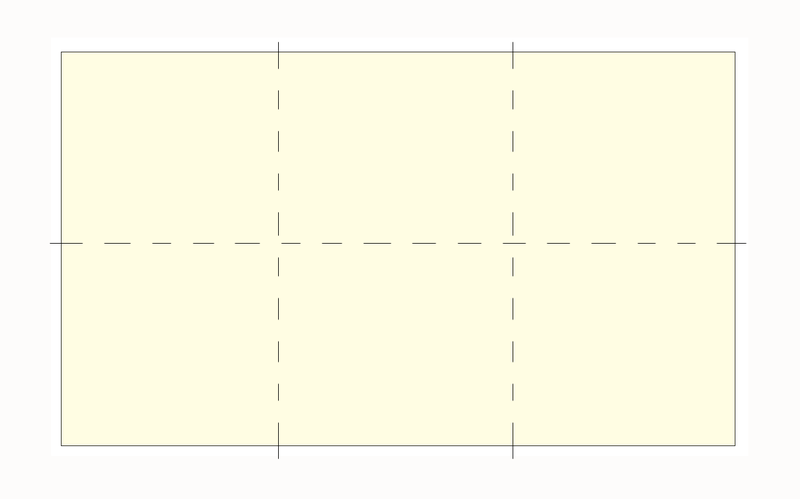 But….this version is as fully awesome (if not more awesome) than the regular version. I love them both and have a sneaking suspicion that there will be more baklava days in our future.